The RISE Alliance was formed in 2015. It consists of four local primary schools and an all through specialist school; the four primary schools are Redfield Edge Primary, Longwell Green Primary, Courtney Primary and Cadbury Heath Primary. The specialist school is New Horizons Learning Centre. It is understood these outcomes will be achieved through collaboration; innovation; commitment; challenge and support; respect; openness; honesty; and trust. 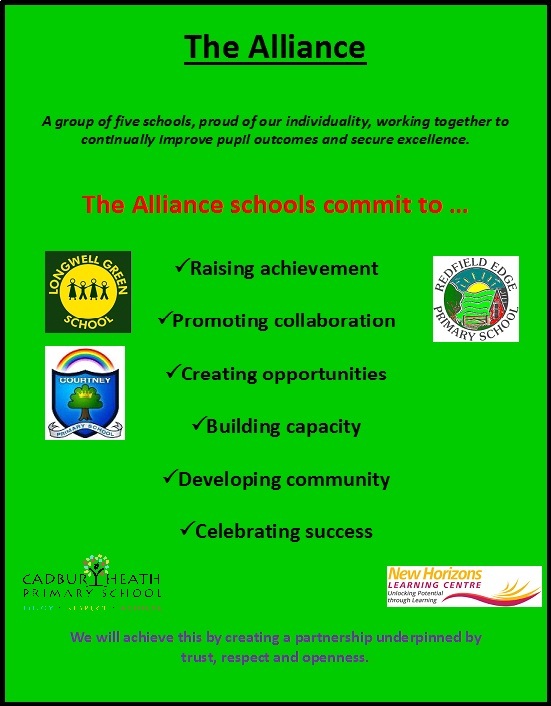 At the beginning of every academic year, the five schools commit to a development plan, the RISE Alliance Development Plan (RADP). The introduction of interschool events such as an interschool debate, an interschool dance festival and an interschool arts project. The development of pupil writing, especially editing and redrafting. The development of computer programming and online safety. The development of joint procurement. The alignment of assessment procedures, enabling in year comparative judgements across schools. The development of common policies. Bespoke training commissioned by the RISE Alliance. The employment of a speech and language therapist to work across the primary school settings. These outcomes will be achieved through collaboration; innovation; commitment; challenge and support; respect; openness; honesty; and trust.